In the flesh, there’s nothing to tell the Figo hatchback from the Figo Aspire compact sedan until the.B-pillar. It’s got the same Aston Martin-esque front grille, peeled-back headlamps and general crisp, clean looks. However, the hatchback has the nicer form from the rear doors on. The roofline flows quite naturally into the tail and there’s a good proportion to the design though the small 14-inch wheels are somewhat of a spoiler here too. Still, styling at the rear is quite neat with smart wrap-around tail-lamps and good definition to the tail gate. What’s also good is that the tail opens to reveal a sizeable luggage bay. The rear seat back also folds forward should you need more space. Unfortunately, the loading lip is a bit high and the boot floor is low so you’ll have to lift heavy luggage more than you’d like. The design is not as captivating, till you take the time to notice the tiny details peppered all around. From the front, the Figo looks understatedly good. The large swept-back headlamp units, sculpted bonnet, gaping chrome-lined grille (a design inspiration from Aston Martin?) with horizontal chrome slats, blacked-out air dam, body-coloured lower lip and recessed fog lamps are the highlights here.Look at it from the side, and the Figo loses out on design flair. While there are strong creases on the car, like the one that flows from the headlamp all the way to the tail lamp, or the one that starts above the front wheel arch and goes through the door handles, the Figo tends to look a bit heavy and the small alloy wheels add some blandness. The large ORVMs with integrated indicators, blackened B-pillar, large windows and gently sloping roof line are the highlights here. At the rear too, the understated but smart looks continue. The short roof-mounted spoiler with the integrated stop lamp, wraparound rear windshield, large taillamps, and the large bumper make up the rear. A noticeable bulge in the hatch door which forms a line connecting the two tail lamps makes the rear look less bland. There are only three badges on the boot lid – Ford’s blue oval, the Figo nameplate and a badge denoting the variant. So there really isn’t anything that makes the automatic look more desirable or spicier from the manual variant. If you have been in the Ford Figo Aspire, then you will immediately feel at home in the Figo. However while the Aspire gets a beige option, the Figo makes do with all-black upholstery. The small steering wheel with audio and telephony controls mounted on it feels delightful to hold. The instrument console is dominated largely by the speedo and is flanked on the left by a tacho and on the right by a fuel gauge. This is the second Ford after the Aspire to have its lighting system controls on the right stalk and wiper controls on the left. This was primarily because it has been designed for right-hand drive countries. Ford has added Sync and other features from the Aspire. While that’s great for the technology junkies, it really boils down to if you really will use these features in real life. For example, I have used the Grand i10 and Xcent on multiple occasions, however, I have never used the 1GB onboard music storage. Similarly, I might never use the Sync or emergency assistance (useful) features. Amongst the most practical features, there are power adjustable mirrors, auto locking doors when in motion, various cubby holes in the cabin and the electric boot release and keyless entry. In terms of space, the new Figo hatch loses out a little. The trunk space has been reduced from the outgoing model’s by 30 litres. But the rear seats will feel a little cramped for three grown ups.The music system is quite decent and better than the competition. The air conditioning as advertised by Ford is very powerful and cools the cabin well. Features that are missing include reverse parking sensors, reverse camera, an unlock sensor for the boot. Yes, Hyundai has indeed spoilt us! But there is a strange inconsistency in the way Ford have spread the features across the variants. For example, the diesel Titanium+ variant misses out on the MyFord dock feature, but the petrol with automatic gets it. Again, the interior of the petrol automatic is very different – it doesn’t get the Sync feature, the infotainment screen is smaller and there are only two airbags (as opposed to the six airbags that are otherwise standard on the Titanium+ trim). But what it gets is traction control, hill hold assist, ESP and gear indicator. The Figo will be available with three engine-gearbox combinations. There’s a 1.2 petrol with a five-speed manual, a 1.5 diesel with a five speed manual and a 1.5 petrol with a six-speed dual clutch automatic. We’ve sampled the diesel and petrol automatic so far and have come away quite impressed.The diesel first. Well, unsurprisingly, it’s the same 1.5 diesel engine as on the Aspire compact sedan (the updated version of the EcoSport’s motor), but the good news is it hasn’t been dulled down for use on the hatchback. That means power is a solid 98.9bhp! As a result performance feels better than lower-powered rivals from the moment you set off. Responses are good right from idle with a gentle surge speeding things up at about 1,500rpm. Thereon there’s an even spread of power right until 4,000rpm. The engine’s not quick revving per se but remains responsive throughout, even in fifth gear. However, gearshifts are a touch notchy and aren’t suited to quick shifts. Driving in town we also noted the diesel car’s clutch to be well-weighted if springy in action. Time to shift attention to the petrol automatic Figo. Again, like the Aspire this version uses a 1.5-litre petrol engine and a six-speed dual clutch automatic transmission. The engine’s peak power of 109bhp helps make this the most powerful of the automatic hatchbacks in India. In town, the engine’s good bottom end responses help this version of the Figo build speed smartly. However, in slow-moving city traffic, you can feel the clutch engage so shifts aren’t super smooth. But once on the go, the gearbox settles into its rhythm and responds well to changes in throttle position. At light loads, the gearbox shifts at about 2,200rpm but drive hard and it will hold to about 6,300rpm. The gearbox has a Sport mode too. It won’t hold gear beyond 6,300rpm but lift off the throttle and the gearbox does well to downshift and bring revs right into the heart of the powerband. Those driving on hilly roads will particularly like the engine braking effect in this mode. Drivers also have the option to shift gears manually in Sport. However, there’s no Tiptronic here, only small ‘+/-’ buttons on the gear lever for this and that’s a bit of a downer. Performance on the whole is good and you won’t have much trouble getting to and maintaining three-digit speed over long distances. On the top Titanium+ trim, Ford provides a programmable key (MyKey) which allows the driver to set the top speed and maximum audio volume. As mentioned, top trim cars get Ford’s Sync system. Usability-wise it’s fine and even has the ability to connect to a few apps. However, the main highlight of the system is its ability to automatically use your phone’s network to alert emergency services in case of an accident. Talking safety, top Titanium + cars also boast a class-best six airbags! All but the base versions (driver’s airbag only) get two airbags as standard which is commendable. Higher variants get ABS and EBD. Ford Figo Ex-Showroom Price in Hyderabad ranges from 4,79,031/- (Figo 1.2P Base MT) to 7,78,833/- (Figo 1.5P Titanium AT). 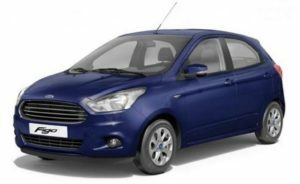 Get best offers for Ford Figo from Ford Dealers in Hyderabad.